HOTEL ZONE AT AFFORDABLE RATES! Beautiful 2BR/1½BA Ocean View Condo Available forDaily and Weekly Rentals! Cancun Vacation Condo Rental, Cancun 'The Crown Jewel of the Caribbean'! Pristine white sand beaches, crystal clear aqua blue seas! Whether you are planning your 1st trip or a return visit, this ocean view 2Bd townhouse condo located in the heart of Cancun´s 'hotel zone' may be just what you are searching for! The perfect answer for your dream vacation in Cancun no matter what size your party is. The two level townhouse style condo has a ground floor entrance, a large master bedroom with 2 queen beds, a private ½ bath and cable TV (both baths are in the first floor). There is also a full bathroom with common access. Upstairs there is another guest bedroom with a queen bed, a kitchen/dining area, a living room with a full size sofa bed, cable TV and an ocean view terrace complete with patio furniture. Perfect for dining outside, enjoying a your favorite beverage or just relaxing. The condo and the property. : The unit will accommodate up to six adults very comfortably. The kitchen is complete with a full size refrigerator, stove/oven, microwave, coffeemaker, blender, toaster, pots, pans, matching dishes and utensils for six persons. The condo has marble floors, central air, an iron and board, ceiling fans, towels and linens and 2 televisions with cable that have both English and Spanish movies and news channels. Everything you will need in your home away from home! Amenities: The condo is located in Villas Marlin, a private ownership property with controlled access to owners and guests of owners only! The complex features 3 swimming pool areas with plenty of lounge chairs, a swim up snack bar, 24 hr security, tennis court, private off-street parking, a mini-market, wide white sandy beaches and a gentle surf safe for swimming. Wireless Internet Access included. Our great Location! : Right in front of Villas Marlin is Plaza Kukulkan, Cancun's largest indoor mall and just a few minutes walk down the boulevard is La Isla Mall, is an open air shopping center in Cancun. Most of the islands major area attractions are only minutes away by bus, taxi or car. It couldn't be more convenient! Area: Villas Marlin which has three ocean front pools, is conveniently located on the beach right in the heart of Cancun´s 'hotel zone' close to all the areas main attractions. Water sports of all types, fishing, panoramic golf courses, night clubs, entertainment, world class restaurants, folk loric ballets, shopping centers, water parks and flea markets are only minutes away by taxi or bus. Visit ancient Mayan ruins, experience exciting jungle tours, swim with dolphins or snorkel live coral reefs. Or just relax and enjoy the perfect year round climate. 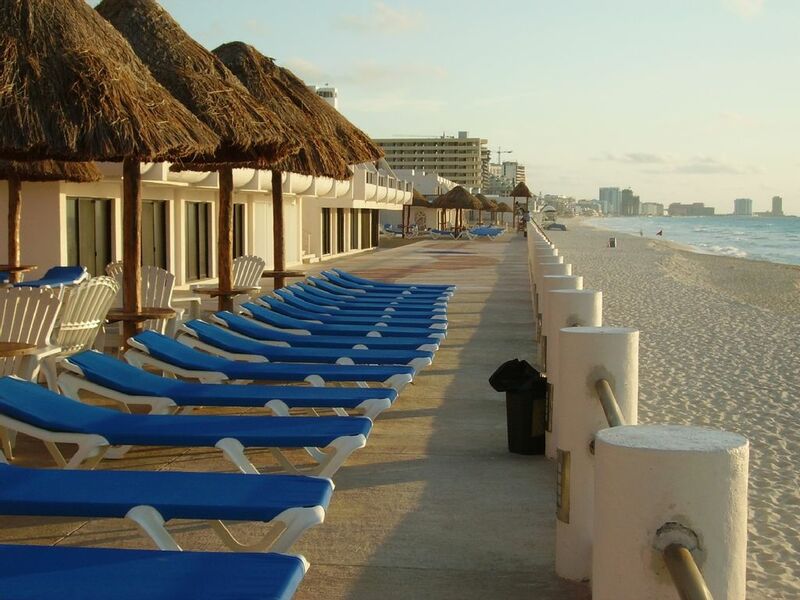 Everything you could want for that perfect vacation is right here in Cancun! This property is a PRIVATE CONDOMINIUM COMPLEX. This property is not a Hotel and does not have Hotel services, the owner shares this condo with other guests. There are many small mini-markets close by Villas Marlin including one on-site that are very handy for picking up small items but can tend to be very pricey. We suggest that our guests take a trip across the street from us to Plaza Kukulkan Mall, inside the Plaza in the second floor you will find SORIANA GROCERY STORE to do your initial shopping to stock up the condo. The prices are as good anywhere and it is probably a format that you are familiar with. There are also buses that run right in front of Villas Marlin marked “Wal-Mart” that will take you directly downtown to WAL-Mart. If you arrive late in the evening and need some supplies there is an “0xxo”, which is similar to a 7-11 store about a block down the boulevard that is open 24 hours. If you are planning on renting a car at the airport just follow the signs towards the hotel zone. Keep an eye out on the right hand side for “Plaza Kukulkan” about halfway through the hotel zone. Take the street that runs behind the Plaza and you will find the entrance to Villas Marlin located on the beach. There is safe, secure, off-street parking available. One parking spot is allotted for each condo. Central air throughout the condo. There is an elevator from parking lot to condo unit, from condo to pools and beach area, there are ramps and stairs. Also includes microwave, coffee maker, toaster, blender, matching dishware, glasses, cutlery and cookware. Ocean view terrace off of the living room. There are three different ocean front pool areas available for guests. We absolutely enjoyed our stay at Villas Marlin! Our unit was clean and stocked with everything basic for our stay. Everyone there, residents, visitors, and staff are very helpful with suggestions on places to eat and attractions as well as how to maneuver around the area safely. Our host happily supplied sleeping for our 17 month old grandchild (I wish I had thought to ask for a baby gate due to the stairs) but all is well. The view of the ocean is fantastic although there are roof lines that block the view of the beach. The mall across the road has everything that you could possibly need for your stay there and is a very safe walk away. The villas are a family friendly complex with a quiet relaxing atmosphere which was quite enjoyable. We are hoping to be able to return next year! Great! Everything as described! Awesome pool and amazing beach right there. Close to all the fun. At the apartment you will have everything you need! Definitely recommend staying here. The location was perfect, walking distance to everything we needed. Jacky & Frank accommodated us from the beginning of our booking until our departure. Security & housekeeping was very friendly & helpful. Awesome stay. Great location for the cost! Well, I must say this is a great place to stay if you want some beach time at Cancun for a reasonable price. We stayed here as a family of six and felt comfortable the whole time. Most of our time was spent on the beach anyways. There is a grocery store just behind this complex in the mall. While all inclusives resorts have their benefits, I’m not sure if they would ever come close to the cost effectiveness of this place. It is not the most “up to date” place but it has all the amenities you need and frankly, you should be spending most your time at the beach (that’s right out front the complex!!!) instead of being inside. There is a great cleaning service that comes every second day, but if you are a larger group be prepared to do a bit of dishwashing on your own in between. Great place. I would stay here again next time we’re looking for a sunny get away from Canada wintertime. My family enjoy the vacation very much. the people at the resort is very nice and friendly, the facility is comfortable. The beach is wonderful, location is convenient. we would recommend this condo. Our condominium is conveniently located right in the heart of Cancun's hotel zone close by most of the area's major attractions. Many are within walking distance. City buses and taxis constantly pass by right in front on the main boulevard.